Is United Technologies Still Worth Buying? The aerospace and construction products company needs to execute in the way competitor General Electric Company did in the past year or so. With United Technologies (NYSE:UTX) in 2016, the aim is take short-term pain to generate long-term gain. The company is in a year of transition in three of its four segments, and if you can ignore the short-term negative impacts, the stock looks like a good value. However, the company needs to execute, so let's look at what's going on and what's in store. General Electric Company (NYSE:GE) outperformed the S&P 500 in the past couple of years, largely because of the successful execution of its strategy to refocus on the industrial sector while developing new industrial technologies that are set to generate strong long-term recurring revenue for the company. 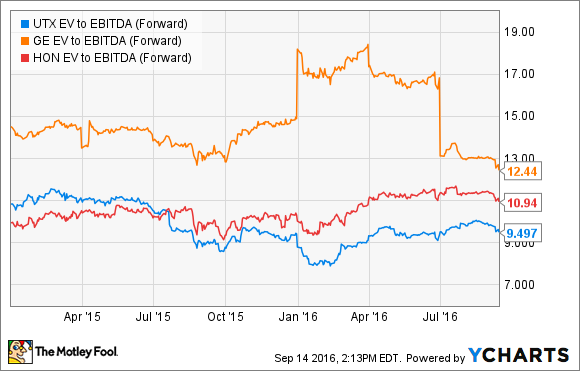 Is United Technologies about to similarly reward investors? SOURCE: AUTHOR'S INTERPRETATION OF COMPANY STATEMENTS. The actions taken are all to ensure long-term growth, and that's why it's a mistake just to look at United Technologies' immediate earnings prospects. Nobody is going to get excited by analyst projections for EPS growth of just 4.7% per annum for the next couple of years: The key is to execute the plan. 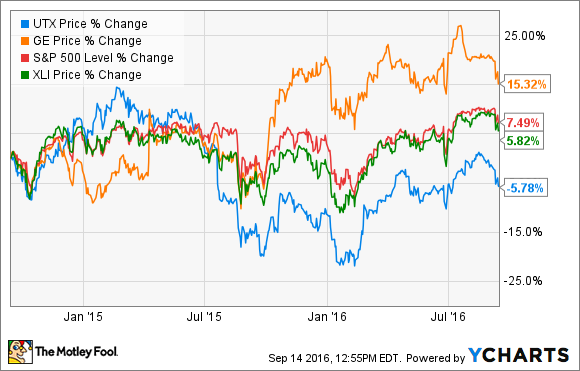 Is United Technologies on track? The following table shows the company's most recent projections for 2016 compared with those at the investor day in March 2016. Current sales expectations are unchanged. However, better profit projections at Otis are offset by a more negative outlook at Pratt & Whitney. Overall, the company appears to be on track. Indeed, in the second-quarter earnings presentation, management upgraded 2016 EPS expectations to a range of $6.45 to $6.60 from a previous range of $6.30 to $6.60. Similarly, 2016 sales are now expected to be in the range of $57 billion to $58 billion from a previous range of $56 billion to $58 billion. However, that's not the full picture. Otis' constant currency equipment orders were down 4% in the second quarter but were up 4% on a unit basis -- good, because the aim is to increase the installed base. On the other hand, on the earnings call, VP of Investor Relations Paul Lundstrom mentioned that the $50 million improvement in the full-year operating profit guidance range (see the preceding table) is "based on better-than-expected foreign exchange transaction." UNITED TECHNOLOGIES NEEDS TO PRODUCE ITS GEARED TURBO FAN ENGINES ON SCHEDULE. IMAGE SOURCE: UNITED TECHNOLOGIES WEBSITE. Higher negative engine margin, per Lundstrom and Hayes. Additional investments made to support the production ramp-up. These headwinds helped result in the cutting of guidance for operating profit in 2016 for Pratt & Whitney. In addition, Bombardier recently slashed ts delivery guidance for its new Cseries aircraft -- a plane powered solely by the GTF -- citing delays in receiving GTFs from Pratt & Whitney. Moreover, concerns have been raised on deliveries of GTFs for the Airbus A320neo, a platform on which the company competes with General Electric's LEAP. All told, United Technologies isn't quite executing as planned with regard to the GTF. However, management affirmed that production plans are on track and the company remains cheap compared with its peers. Management still expects 90% to 100% of net income to be converted into free cash flow in 2016. Based on analyst estimates for EPS of $6.58 in 2016, it equates to about $6.25 per share in free cash flow. In other words, around 5.1% of enterprise value (market cap plus net debt) -- and that's not bad for a company in a transitory year. Despite the minor setbacks with the GTF, the stock remains attractive.